We’d love your help. Let us know what’s wrong with this preview of Ahimsa by Supriya Kelkar. But it turns out he isn't the one joining. Anjali's mother is. And with this change comes many more adjustments designed to improve their country and use "ahimsa"—non-violent resistan In 1942, when Mahatma Gandhi asks Indians to give one family member to the freedom movement, ten-year-old Anjali is devastated to think of her father risking his life for the freedom struggle. To ask other readers questions about Ahimsa, please sign up. Review originally posted on A Skeptical Reader. Ahimsa is about a ten-year-old Anjali who’s mother has just quit her job working under the British Raj for undisclosed reasons and a rising Independence movement is about to take her entire life by storm. It opens up with a black Q painted on the side of her mother’s ex-boss’s wall and it takes one into the journey of ahimsa—a practice of nonviolence towards all living things. Anjali is a remarkable character, a child with flawed perceptions of the w Review originally posted on A Skeptical Reader. Anjali is a remarkable character, a child with flawed perceptions of the world who learns to emerge from her prejudices and disposition to make a difference. Children’s fiction offers adults a very unique opportunity to settle into the mindset of a youth struggling to grasp the adult world and through Anjali’s eyes, we see the struggles not only of a child but also of her country. India is an incredibly dense region of mixed behaviors and cultures. It’s land that’s gone through hundreds of years of turmoil, integrating people from all walks of life. I cannot emphasize how beautifully Supriya Kelkar has managed to sketch all the nuances of Indian cultures into a children’s book. There are several groups of caste, race, and religion that clash amongst each other and Kelkar explores them perfectly for readers of several ages to grasp. Whilst reading it, I was having a conversation with a friend about caste and how hard it is to explain the caste system in India to any immigrant but coincidentally, right after that conversation, Kelkar presents a scene where Anjali is asked to examine her sisterly attachment to a Muslim boy, Irfan, when she refuses to even touch a member of her own religion, an Untouchable. Surprisingly, the author even paints Gandhi more realistically, illustrating the hypocrisy and racism of the Father of India himself. To do all of this in an adult novel would be an amazing feat but Kelkar manages to pull it off in a small children’s book, assimilating Anjali’s own limitations with it. I wouldn’t necessarily say this book is easily accessible to all children. There are words, terms, and subtleties that I think some readers in the West might have difficulty understanding. There is a note in the back of the book where Kelkar has laid out the context to a lot of the major events that occur in the novel so I’d definitely recommend reading that afterwards. As for the writing, while I don’t think it stands out in an extraordinary way, it does make for a very fast and absorbing read. My attention never once faltered so it’s easily readable in one sitting. And even with the deeply political nature of the novel, Anjali remains a lively character I’ve come to cherish. Ahimsa offers a fascinating glimpse into the world of the freedom movement in India in the 1940s. While I knew a little about Indian history from movies like Gandhi and Water, it was interesting seeing it all from the perspective of 10-year-old Anjali. I think kids will really connect with her as she grapples with giving up the trappings of her privileged lifestyle and learns to embrace the movement. A minor gripe of mine is that Kelkar refers to a Gandhi quote several times that is slightly ina Ahimsa offers a fascinating glimpse into the world of the freedom movement in India in the 1940s. While I knew a little about Indian history from movies like Gandhi and Water, it was interesting seeing it all from the perspective of 10-year-old Anjali. I think kids will really connect with her as she grapples with giving up the trappings of her privileged lifestyle and learns to embrace the movement. A minor gripe of mine is that Kelkar refers to a Gandhi quote several times that is slightly inaccurate. Gandhi never actually said "Be the change you wish to see in the world." He said something similar when he said, "We but mirror the world. All the tendencies present in the outer world are to be found in the world of our body. If we could change ourselves, the tendencies in the world would also change. As a man changes his own nature, so does the attitude of the world change towards him. This is the divine mystery supreme. A wonderful thing it is and the source of our happiness. We need not wait to see what others do." With the incredible attention to detail Kelkar uses in the rest of the book, this mistake rubbed me the wrong way every time it popped up. Complex and captivating, with a truly moving and emotional climax, this is a wonderful novel that will educate and inspire. - Book is written in the perspective of 10 years old girl Anjali who's life changes when her family takes part in Indiana freedom fight. - the book is written in very simple language and it's easy to understand without any hassle. - all the characters in the book are so realistic, at point I thought I am reading a first hand account of some freedom fighter. - book also puts light on the one of the biggest issue in Indian community. The difference between cast and how it has affected people. - a well written book, our younger generation must read. - narration and pace of the book is excellent. In no time I was finishing the book and oh I love it so much. In a small town in India in 1942, Anjali is worried that her mother has lost her job working for a British colonel, Brent. At the age of ten, her biggest worry is that there won't be enough money to buy a new dress for her for the holiday. It turns out that there are much bigger problems brewing. Anjali's mother has quit her job so that she can join the resistance to the British, which in her case means learning to spin and weave so that India isn't dependent on the British processing their cotton. Anjali has a friend, Irfaan, who is Muslim, and while the two of them never minded the religious difference, this also becomes a problem. Anjali's mother is upset with the way Untouchables, whom Ghandi started to call Harijans, are treated, and decides that she and Anjali will clean out their own outhouse instead of leaving it for Mohan. Mohan, of course, needs the work, but the discussion with him about what his people need gives them some insight. For one thing, the term he preferred was "Dalit". As the political situation in India becomes more and more serious, it's not enough for Anjali and her mother to give food and treats to the Dalit; they set up a school, and eventually, the mother is taken to jail for "inciting riots". While Anjali fears for her mother, she would like to see change in her society but realizes that it will be very difficult. Strengths: I especially liked that the author based this on her grandmother's actions at this point in history. There are a lot of great details about what every day life was like, and good discussions about the Indian social structure and how it wasn't beneficial to the society as a whole. Anjali is a typical ten year old, who is more concerned with how things affect her. The inclusion of an older uncle who is opposed to the family's work in the resistance is a good one. This is a fascinating period of history that I wish more of my students knew about. Weaknesses: There might be a lot of this that middle grade readers might not understand. Some more extensive notes on Indian history at this time would have been helpful. Also, I wish that Anjali had been a little older and had a better understanding of her society. A stunning tale of social justice set in 1940s India, AHIMSA gives readers a glimpse into what the true meaning of non-violent resistance is. A required purchase for school libraries. This story has now become my absolute number one title to recommend about social justice and equality in any era, country, religion or race. 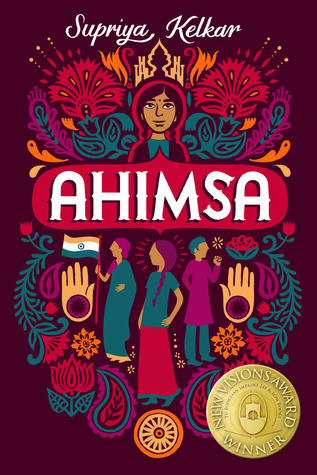 Kelkar has done such a superb job of with this story that although it is set in 1940s India a A stunning tale of social justice set in 1940s India, AHIMSA gives readers a glimpse into what the true meaning of non-violent resistance is. A required purchase for school libraries. This story has now become my absolute number one title to recommend about social justice and equality in any era, country, religion or race. Kelkar has done such a superb job of with this story that although it is set in 1940s India and deals with the caste system, English colonialism, and religious strife between Muslim and Hindu groups, the messages she conveys can be applied to virtually any other country and time period and still be applicable. This story is a timeless choice for classroom use, as the events and messages can be compared to so many other situations and will make for rich discussion and analysis. Included in the book is a very thorough afterword by the author about the genesis of the novel as well as a general overview of the history of India and a glossary. Ahimsa: Nonviolence. Anjali's world seems to be filled with aggression and violence as India struggles against the British government in 1942. The people are also struggling against each other. Graffiti, vandalism, riots, beatings and other forms of violence build throughout this story. Anjali's courage and hope for an equal, free country builds as well. This is a beautiful story about the power of small actions that lead to great change. I couldn't put Supriya Kelkar's debut novel down. Disclaimer: A Physical Copy was provided via Scholastic India in exchange for an honest review. The Thoughts, opinions & feelings expressed in the review are therefore, my own. Ahimsa is an enthralling look at the Quit India Movement or the Freedom Movement of the Indians against the British Empire in the 1940s. Told in the perspective of a 10 year old privileged Indian girl; Anjali – who is secure in the knowledge of being a Brahmin kid, who gets the best dresses and is the apple of her parent’s eyes. Her best friend is Irrfan; a Muslim boy, and that makes okay for Islam doesn’t really have a caste system. Everything in her perfect world starts to splinter when her mother leaves her cushion-y job with Captain Brent in the British Army – and decides to join in the Freedom Movement. Her confusion at the world around is easy to understand and definitely empathize with, for all that she has always taken at face value, the world she has believed to be right; is now slowly proving themselves to be wrong. It was amazing to see how Anjali took everything she has been told and to connect it with the world that she is now living in. 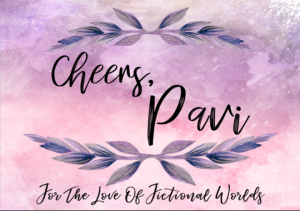 I loved how the author shows the growth of character in Anjali – from believing what she has always been told; to deciding what is right for herself through her own experiences – her confusion, her reluctance was as real as it gets. This book is a definite recommendation for any young kid or even teenager (and I do believe, that some adults could also definitely use it!) to not only understand their legacy but also know that the path to be kind and humane isn’t easy; but it is definitely worth every second of struggle. Gandhi, a practitioner of Ahimsa, or civil disobedience, had already asked that one member of every family become a fre It’s 1942 and while Britain and the rest of the world are engaged in WWII, in Bombay (today’s Mumbai), the Quit India movement, whose goal is to rid India of British rule and gain independence, is begun with a speech by Mahatma Gandhi on August 8th. The very next day, August 9, 1942, Gandhi is arrested but it doesn’t stop many from still having faith in the Quit India movement. Great example on how books act as windows. I want to learn all about that time in Indian history. Ahimsa means nonviolence. That is the main motive for the Freedom Fighters of India. It's the 1940's and the Indians are under British occupation, and the Indians want them out. We follow a girl named Anjali and meet her as she is painting a giant black Q (Quit India) on the side of a British Officer's house. Anjali’s mother used to work for a British Officer as a secretary, but she quit because she was tired of all the British decrees and that the officer wasn't helping Indians who were wrongly Ahimsa means nonviolence. That is the main motive for the Freedom Fighters of India. It's the 1940's and the Indians are under British occupation, and the Indians want them out. We follow a girl named Anjali and meet her as she is painting a giant black Q (Quit India) on the side of a British Officer's house. Anjali’s mother used to work for a British Officer as a secretary, but she quit because she was tired of all the British decrees and that the officer wasn't helping Indians who were wrongly accused of crimes against the British. Anjali's normal life is flipped upside down when her mother joins the freedom movement and burns all of their foreign-made clothes. They also start cleaning their own outhouse and be-friending the "untouchables," or the Dalit community. The untouchables are the people who get the most hate and prejudices because they clean toilets and are seen by others as unclean. Anjali befriends some of the Dalit kids. Her mother and some of the other freedom fighters try to integrate the Dalit children into Anjali's school, which ultimately causes problems for everyone involved. I liked this book. It was a different kind of story from what I usually read, but that made it memorable. I liked the friendships in the book between people who had different backgrounds. There was some bullying to the main characters, and the violence between the Hindus and Muslims reminded me about what I’ve learned about the Egyptians and Romans and how they fought a lot. This book is a great introduction to cultural diversity, and it also taught me about India's history. I just have the one book to report on this time around. It's called Ahimsa by Supriya Kelkar, and it's a historical fiction children's novel about India in the 1940s. It tells the story of 10 year old Anjali, an Indian girl, who, with her family, works to help free India from British rule, as they occupy the country around this time. And while contentions between the British and the people of India rise high, other such contentions among the natives are also pretty heated. The book describes ten I just have the one book to report on this time around. It's called Ahimsa by Supriya Kelkar, and it's a historical fiction children's novel about India in the 1940s. It tells the story of 10 year old Anjali, an Indian girl, who, with her family, works to help free India from British rule, as they occupy the country around this time. And while contentions between the British and the people of India rise high, other such contentions among the natives are also pretty heated. The book describes tensions between Hindus and Muslims as well as the people who fall into the different castes that India has. Caught in the conflict, Anjali risks losing those who are important to her; her best friend, who is Muslim, her mother who gets imprisoned for speaking out for what is right, and her friends and neighbors, many of whom frown down upon her when she makes continued efforts to bring in kids from the lowest caste, into her school. The story really helps bring the reader into Anjali's world and allows them to see her struggle for freedom, as well as that of her whole country. Overall, I thought the story was well written and the author really brought to life each character, particularly the main character. You get a sense of what each character is about and see a bit of character development in some of them. For example, one of the antagonists, Captain Brent, a British officer, has several encounters with Anjali. When we first meet him, he is seen as an apathetic, hard nosed kind of man. Anjali strongly dislikes him in the beginning and the feeling is mutual of him towards her. But as you continue to read, Brent seems to have a change of heart. And while still not appearing to "like" Anjali or any of the people of India, towards the end of the book, you see that he begins to respect her, which is quite a rewarding thing to see from the reader's point of view. And thanks to some basic foreshadowing used by the author, you can see what events led up to this. And this, in turn, sort of helps solidify Anjali's maturity and growth; earning the respect of someone who initially thought very little of her. I was fascinated by this historical novel about India in the mid 1940’s. Told from the perspective of a 10 year old girl whose mother joined the freedom fighters to bring independence from Britain. I was transported into the sights, smells, sounds of life then. I especially liked that there is complexity in trying to help others because those desires don’t always mesh with what the recipients want. This was a touching and informative read about the freedom movement in India to reclaim the country's government and economy from the British. I loved the nuances in this story, and it gave me a better understanding of that area and political climate in the 1940s. The main character Anjali, a ten-year-old, is thoughtful and feisty. A must-read for middle graders and beyond! A careful and compassionate look into the Indian independence movement. This is a relevant and timely read given current events in India and the world. n this tech age, our kids and we have a pool of opportunities awaiting us. We are free to choose a lifestyle we want. We think of our freedom fighters only on national days. What if I told a 10-year-old girl participated in the freedom struggle? It sounds surprising and unbelievable, isn’t it? At an age where not many children are capable of doing things on their own, a 10-year-old girl decides to become the strength of her mother and also participates in the freedom struggle in her own ways. Th n this tech age, our kids and we have a pool of opportunities awaiting us. We are free to choose a lifestyle we want. We think of our freedom fighters only on national days. What if I told a 10-year-old girl participated in the freedom struggle? It sounds surprising and unbelievable, isn’t it? At an age where not many children are capable of doing things on their own, a 10-year-old girl decides to become the strength of her mother and also participates in the freedom struggle in her own ways. This book Ahimsa written by Supriya Kelkar is a story of a 10-year-old Anjali, a Brahmin whose Mother worked for British Raj, however, had to leave the job given the struggle of freedom that changed lives of many and marks itself as the biggest struggle for freedom in the history of the world. Ahimsa is a book from a 10 yr old’s perspective. Set in the year 1940s during India’s struggle for freedom. Her world is secure and happy because of her being from the privileged caste. Anjali and her best friend, have no care in the world. The innocence of their childhood is visible in the way they happily celebrate each other’s festivals. When Anjali’s mother leaves her job at Capt, Brent, Anjali’s happy world falls apart. Anjali believes that her mother is fired from her work and decides to find out why given her attention to detail and reasoning. When she doesn’t get satisfactory answers, she and her partner in crime Irfan, vandalize the British property. Soon she comes to know that her mother is going to be a freedom fighter which is the reason why she has quit her job. It is indeed difficult for a child to understand why her mother is doing what she is doing however it doesn’t take her long to start supporting her mother. She resonates with her mother about her limitations as a child while participating in the freedom fight and hence decides to take up teaching. She notices the difference in behavior towards the untouchables and starts imparting education to them. I think this book doesn’t restrict itself to being a children’s book. It is fast paced and suits all age groups. While you are reading the book you are taken back to the era to experience what freedom struggle really was. Your heart definitely goes out to all those people who were at war then. As a society, we still have differences based on caste creed and color. We still have a section of society that treats some people as untouchables. The plight of untouchables was unimaginable then. We have definitely evolved and grown as a nation, however, I personally feel that we still need to free ourselves from certain societal barriers and unlock our contradicting thought process and be more open to change. The narration is smooth and very easy to understand. Author has done a very good job of weaving characters beautifully into the book. The Character, I most like is Mohan. The raw emotions he exuded were very potent and I was moved to tears many times. This book is a definite read for Kids and Young Adults. I am sure, even adults would enjoy this book. Authored by "Supriya Kelker" @supriya.kelkar inspired from her own Grand Ma 's life experiences from the freedom struggle days , this book from the perspective of a 10 year old girl born and brought up in Brahmin family , taught to disregard backward/ lower community & classes , wear foreign made dresses in the backdrops of 1942 , the famous Indian struggle for independence under the leadership of MK Gandhi when her own mother quits her British govt based job to contribute in the independenc Authored by "Supriya Kelker" @supriya.kelkar inspired from her own Grand Ma 's life experiences from the freedom struggle days , this book from the perspective of a 10 year old girl born and brought up in Brahmin family , taught to disregard backward/ lower community & classes , wear foreign made dresses in the backdrops of 1942 , the famous Indian struggle for independence under the leadership of MK Gandhi when her own mother quits her British govt based job to contribute in the independence movement , learning to judge herself if she is taught wrong and what needs to be done , is a heart wrenching educational fiction that is effective in making its mark in the hearts of modern kids of today 's world . It is an empowering tale that shows naked truth of caste system which still sadly exists through the eyes of a young kid .The way Anjali develops understanding of patriotism by experiencing herself the struggle of her fellow people under the foreign power eventually , shows us this book aims to tell children of now to hail the ideals of equality , compassion, fraternity for all citizens irrespective of caste , creed and religion. This is a sure thing to be cherished not only by a single group but all age groups equally. I read this quite awhile ago, but I never got around to actually rating and reviewing it for some reason. Since this book's subject and the legacy of the partition is entirely relevant to the present state of foreign relations between the two rival countries, I thought today would be a good time to weigh in on this book given the escalation of events between Pakistan and India as of lately. This is a really great children's chapter book that serves as a valuable history lesson, especially to Ame I read this quite awhile ago, but I never got around to actually rating and reviewing it for some reason. Since this book's subject and the legacy of the partition is entirely relevant to the present state of foreign relations between the two rival countries, I thought today would be a good time to weigh in on this book given the escalation of events between Pakistan and India as of lately. This is a really great children's chapter book that serves as a valuable history lesson, especially to American children (and adults for that matter) that don't really know much about India's struggle for independence against British colonialism. I also enjoyed the nuanced discussion on caste tensions between among the Untouchables and Brahmins, and the dispute between Muslims and Hindus in the region. Eventually after independence is achieved, Pakistan and India would form creating the largest mass migration in history - dividing the people among religious lines. This is a wonderful book for anyone who wants to learn more about India and the independence movement that was led by Mahatma Gandhi in the 1940s. Citizens are encouraged to use "ahimsa" or non-violent resistance to stand up to British rule. In 1942, Gandhi asks for one member of each family to join the freedom movement and Anjali's mother joins the effort. This story is told from the perspective of ten-year-old Anjali and we learn about the struggle of the movement, issues of the caste system a This is a wonderful book for anyone who wants to learn more about India and the independence movement that was led by Mahatma Gandhi in the 1940s. Citizens are encouraged to use "ahimsa" or non-violent resistance to stand up to British rule. In 1942, Gandhi asks for one member of each family to join the freedom movement and Anjali's mother joins the effort. This story is told from the perspective of ten-year-old Anjali and we learn about the struggle of the movement, issues of the caste system and how individuals work to make their town a better place. Ahimsa is about a 10 year old girl, Anjali whose mother, a british captain’s assistant decides to be conducive in the freedom struggle against the British. This decision distorts Anjali’s perfect and happy life. The book takes you from Anjali finding happiness in designer gagra-choli to wearing khadi one’s. From her being a Brahmin to standing up against village for Dalits. The story however is beyond the sacrifices made by Anjali. It also talks about the freedom struggle of India against Briti Ahimsa is about a 10 year old girl, Anjali whose mother, a british captain’s assistant decides to be conducive in the freedom struggle against the British. This decision distorts Anjali’s perfect and happy life. The book takes you from Anjali finding happiness in designer gagra-choli to wearing khadi one’s. From her being a Brahmin to standing up against village for Dalits. The story however is beyond the sacrifices made by Anjali. It also talks about the freedom struggle of India against British as well as within her own people. And mostly Anjali’s and her family’s contribution in it. I thoroughly enjoyed and loved reading this book. It is one of the most simple, outstanding and non-violent description or fictional retelling of the fight for freedom rein. Even if it is from a 10 year old’s vista it is a enlightening read for all. The book instills a feeling of self belief and standing up for it. Anjali and her mother’s characters are very well woven not failing to make you fall for their love and bond. Anjali’s mother is a very strong and opinionated woman leading her daughter in this journey of becoming a freedom fighter also setting goals for Anjali and for us at the same time. I absolutely adored her. Even if I wasn’t reading this book or was doing something else I was constantly hit by her strength and fortitude. Anjali like all 10 year olds is quiet immature but very determined and courageous, exhibiting her mother’s traits. Her character development is very realistic and some what influential. Her transition is applaudable and again sets goals for us. I would recommend this book to all those who are interested in reading about our freedom struggle in a fictional and different perspective. Also a great read for children. This is a (timely) historical fiction tale of a country fighting for justice, a society struggling to advance past its archaic caste system, and Ahimsa, or peace, woven throughout its entirety. I liked the strong female characters and a glimpse into a time period not many children read about. The cover is simply to die for! Gorgeous. Thanks to Edelweiss for the the e-version of the ARC. Ahimsa will hit the shelves on October 2, 2017. Be sure to look for it! It has already earned the New Visions This is a (timely) historical fiction tale of a country fighting for justice, a society struggling to advance past its archaic caste system, and Ahimsa, or peace, woven throughout its entirety. I liked the strong female characters and a glimpse into a time period not many children read about. The cover is simply to die for! Gorgeous. Thanks to Edelweiss for the the e-version of the ARC. Ahimsa will hit the shelves on October 2, 2017. Be sure to look for it! It has already earned the New Visions Award! The 11-year-old and I really enjoyed this one. We had recently read The Night Diary by Veera Hiranandani and Amal Unbound by Aisha Saeed. The three novels complemented each other very well. We learned so much about India's independence from British rule (Quit India), the split of India into India and Pakistan, and the lifestyles of children/families from these areas and time periods. We give all three novels a big thumbs up. A rare topic in children's literature, this approachable story set during India's struggle for freedom in 1942, based on the author's grandmother's experiences, is interesting, moves quickly and will have you on the edge of your seat at times. A boy and girl character will encourage both genders to read it. I learned much, even before reading the author's note. Highly recommended. Ten-year-old Anjali's comfortable life changes dramatically when her parents decide to honor Mahatma Gandhi's request that every Indian family give one member to the fight for freedom from British rule. Her mother takes the active role. I got so into the history of the story--the details were clear and fascinating. The writing took me out a few times, especially at the beginning. Still though, I would recommend without hesitation to any of my students.